There’s nothing more depressing than waiting months or even years for your angel fish to develop those beautiful long flowing fins only to see them slowly flake off and wither into nothingness. The fish swimming through those flakes must feel they’re in a special snow globe o’ hell. Luckily, as long as you are paying close enough attention to your fish, fin rot can be easy to diagnose as well as treat. Otherwise, if you happen to have gotten sucked into a week-long Sponge Bob marathon, fin and tail rot can end your fishy’s little life. This disease is most commonly a secondary infection caused by pseudomonas, aeromonas or flexibacter bacteria after a fish has acquired a wound. Fin rot symptoms have a wide range. You should be on the lookout for discolored fins, fins that are split, ragged or frayed, holes in the fins, fins with edges that are white or waxy looking, chunks of fin flaking off (sometimes all the way to the body), exposed rays and red bloody patches. While fin rot is generally easy to treat, here are a few suggestions on how to simply avoid the problem in the first place. Keep stress low. A stressed out fish is a fish with a lowered immune system. Provide hiding places, plants, and the proper water parameters particular to the fish species you keep. 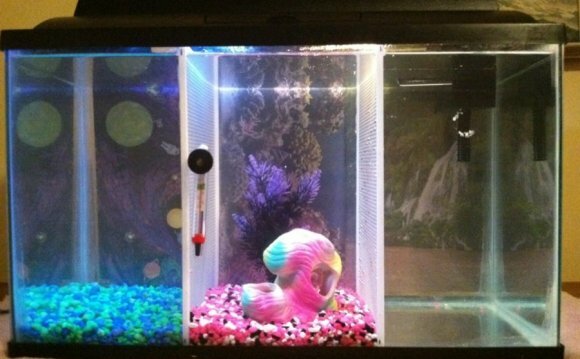 Also allow your fish to have a suitable day/night cycle (turn the lights off at night). Maintain good water quality. In addition to a filter with good biological media (I prefer Marineland Bio-wheel filter systems) you MUST do monthly water changes of 25-30%. This will keep ammonia and nitrite at safe levels. If you keep large predators, goldfish or koi, I recommend doing bi-monthly water changes at the least. Make sure all fish are compatible. As mentioned before, fin rot is generally a secondary infection. Be careful not to keep nippy fish in with docile fish. The nippy fish will take chunks out of their fins, stress out the fish, and provide a nice breeding ground for fin and tail rot causing bacteria. If this is happening, promptly remove the aggressor. Research your fish before you buy. Don’t overcrowd the aquarium. A good rule of thumb is to keep one square inch of fish per gallon of water. Keep in mind, it may take several smaller fish (neons, rasboras, etc) to make a square inch. If you keep goldfish or koi, switch it to two square inches of fish per gallon. Overcrowding can cause undue stress for fish and sometimes make relatively peaceful fish get a bit nippy. Provide proper nutrition. Different species of fish require different amounts of protein and vegetable matter to keep them healthy and happy. Make sure to feed high quality foods with low ash and remember to mix it up a bit. Provide a variety of foods to make sure your fish are getting all of the nutrition needed. Avoid old fish food and remember not to over feed! Look for tips on figuring out the proper amount to feed on my Get Rid of Ick page. If prevention of fin and tail rot has failed you, you hadn’t yet learned how to prevent it, or you just managed to buy a fish already suffering from fin rot, don’t worry. Fin rot treatment is easy and medications are readily available from local fish stores and online vendors. In most cases treatment for fish fin rot is as easy as dropping some tablets or drops in the water. In my experience, the most effective fin rot medications come from Mardel. Mardel makes a variety of very effective fin and tail rot medications such as Maracyn, Maracyn-Two, Maracyn Plus Antibacteria and Tetracycline. I have found that doing a partial water change before adding the medication yields faster and better results. This is especially true if you are dealing with betta fin rot or gold fish fin rot. Betta and goldfish fin rot can also be combated by raising the temperature a few degrees along with the fin rot medication. Cooler water can sometimes provide better conditions for the fin rot bacterium. I recommend keeping fin and tail rot treatment on hand at all times. In my experience, it seems that problems in the fish tank are usually noticed after normal business hours or on weekends when getting the right meds can be hard. Knowing how to identify and properly cure fin rot is important to all hobbyists. Make certain to read and closely follow the directions for any fin rot medicine. Melafix. This is a highly effective and natural antibacterial remedy. The primary active ingredient is tea tree extract. This product helps quickly heal abrasions and wounds, helps to regrow damaged fins and has no adverse affects on your biological filtration. You can get Melafix in a variety of sizes (we recommend 8 oz) from Amazon. Aquarium salt. This natural substance not only aids in the gill function and osmoregulation in fish, but also helps fight infections and strengthen fish. Be certain to use actual aquarium rock salt, not marine salt or table salt. Add slowly in a solution dissolved with water. You can get Aquarium Salt also from Amazon. What do wild Betta fish eat?